North Augusta and Township of Augusta (Lower Tier Leeds and Grenville)Record Owner? Log in. The place was founded in 1811 and in the 1820s known as Bellamy's Mills and Bellamyville after brothers Edward, Samuel, Chauncey, and Hiram Bellamy who took over a sawmill owned by the original Loyalist settler, Daniel Dunham. Ironically, he was a cousin of the Bellamy brothers whose enterprises included a distillery. The divisions within the Methodist Church before Church Union in 1884 were clearly visible within the small community. In 1871, when the population totalled 400, there were three Methodist churches: the Wesleyan Methodist, the Episcopal Methodist, and the New Connection Methodist. When the post office opened in 1840, the community took the name of the T. in which it was located. 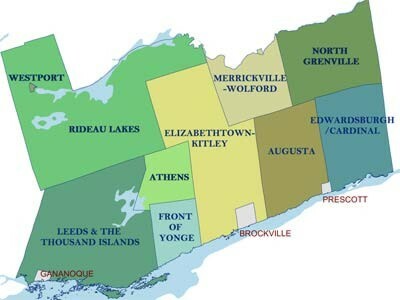 Have something to say about North Augusta and Township of Augusta (Lower Tier Leeds and Grenville)? North Augusta, my home town, is a nice quiet community in which to live and raise a familly. Boasting 2 stores, 2 restaurants, an LCBO store, Auto wrecker, horse riding stable for the physically challanged amongst other things.